Sound is everywhere, it is as much a part of our lives as the air we breathe and the food we eat. Yet many of us becomes stressed or uncomfortable with sounds in our own home, school, work, and public places, and aren’t even aware of it. Negative sound exposure has a scientifically proven impact on health, sleep, attention, learning, communication, listening and more. There is an easy and effective solution…TLP SpectrumTM creates a healthy relationship with sound. It trains the brain with pleasing evidence-based music which has been developed to improve sound brain fitness, reduce sensory sensitivities, and help people find comfort in their environment. TLP Spectrum™ is ideal for children and adults with autism spectrum disorders, sensory processing disorders, brain injury, and developmental delays as well as typically developing toddlers, preschoolers, and the elderly. Find out if TLP Spectrum™ is Right for You or someone you care about. Award winning Music for Babies™ includes classical music, folk tunes, lullabies and nursery rhymes specifically arranged to enhance a baby’s brain development while providing a nurturing environment. Just as food nourishes a baby’s growing body, the elements of music – melody, tone and harmony – nourish a baby’s rapidly developing brain. Music for Babies fosters the brain growth crucial to healthy young minds. Each volume has been carefully crafted to provide the kind of musical nourishment that scientific study has shown will actively support optimum brain development in a child’s early years. By playing this music, you help build a strong foundation for the innate potential of your infant or toddler. Uniquely appropriate for children from birth to 36 months, Music for Babies is equally enjoyable for older listeners. Incorporating Sound Health® into your daily life can produce profound and wonderful changes. A sophisticated combination of therapeutic benefit and artistic achievement, these masterful classical recordings are founded on the principle that music is an effective tool for enhancing health and well-being. Each is intended to complement specific activities, employing extensive scientific research and clinical study to achieve its intended effect. Creating a world of rich and varied soundscapes, Sound Health nourishes mind, body and soul. High-Resolution, High Definition recordings at 24-bit/192 kHz, providing a full spectrum listening experience rich in harmonics and spatial detail. We’ve taken our Sound Health collection to a new level with high-resolution recordings that offer the highest audio quality available on compact disc. 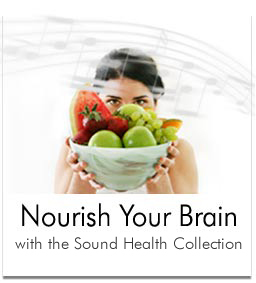 In addition to the advanced psychoacoustic techniques we use to produce our other Sound Health CDs, the “Premium” collection is recorded entirely at 24-bit/192kHz High Definition. This state-of-the-art technology provides you with the richest possible listening experience, while maximizing the efficacy and benefits of our music. Our vision is to transform the life of every person by making sound brain fitness universally attainable. We create innovative, evidenced-based solutions for people actively looking to make a positive change in their life or the lives of others. The company was founded in 1998, by Alex Doman, building on his family’s three generations of pioneering contributions to the field of human development. Products and services include; The Listening Program, Healing at the Speed of Sound, Sound Health, Music for Babies, BrainBuilder, audio equipment, and professional training courses. Today, Advanced Brain is the leader in sound brain fitness and has helped hundreds of thousands of children and adults throughout the world improve their lives.